As activists, often our greatest challenge is overcoming the feeling of separation that our society implants in us from birth. We have moments of clarity, when we see separation in the foundations of our own perspective, but we usually operate as one individual, alone, and at odds with the rest of the world. We see this paradigm reflected in our group consciousness as well. This point of view makes coalition building difficult. It is hard to identify the unconscious assumptions that feed our needs and wants. We speak and react from this embattled, separate position, and thus push others away who might be able to help us. We all fall into place along a spectrum of ideas and needs, and while we may draw energy and support from those near us in a particular belief system, it is still exceedingly easy to get caught in judging someone else as wrong or misguided, and end any attempt to work side by side with them towards a greater good. Thankfully, there are a myriad of tools available that help us overcome these problems. The “Building Critical Mass For Critical Change” workshop introduces us to many of them. Conceived and presented by Allison and Dave Ewoldt, this 4-hour presentation offers tools and experiences that work for groups of all sizes; from big-tent, ecosystem-wide network-building coalitions right down to a small, volunteer work party bent on picking up litter from within a local watershed. We learn about natural system principles, legal and conceptual frameworks that encourage sustainability, relational models that support project management and building consensus, practices that enable effective communication, and guides that help us manage complex change. Small group exercises allow us to practice some of these techniques. Personally, I enjoyed a chance to connect with my local activist community, meeting representatives of many groups that I had not known about before. 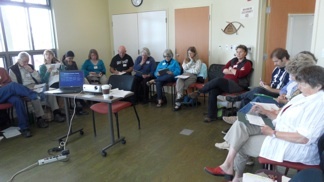 My fellow participants bring a wealth of experiences, and differences, to the workshop. Yet it is refreshing to see that we also share a common dream: engineering a future that rests on shared values of respect for all life, social and economic justice, and nonviolence. What are some ways to approach coalition building? How can we increase our resiliency? How do we manage complex change? What have we experienced in previous attempts to build coalitions? What does history tell us? What worked and what didn’t? No food chain, no food. Neither democracy nor an economy can exist on a dead planet. Alleviating root causes will free up time and resources currently dedicated to slapping band-aids on single issue symptoms (the wounds of empire). There is a pragmatic, scientifically validated, spiritually meaningful alternative to business as usual, and it can improve quality of life. Derek Tennant has written several books. His website is derekjoetennant.net. He works with the Pachamama Alliance, whose mission is bridging the indigenous and modern worlds. The workshop was organized by Transition Santa Cruz and was held on June 9, 2011 at the new Live Oak Family Resource Center in Santa Cruz County's community of Live Oak. Thanks Derek and Jan for getting this out there, and for all your other work on behalf of all of us.